Why are you giving me Shoulder Blade exercises if I have Shoulder pain? Have you been to PT for shoulder pain? Have you been given shoulder blade strengthening exercises plus actual shoulder exercises? If I were a patient, I'd be thinking, "those therapists sure are giving me a lot of exercises." The truth is, the shoulder blade has to elevate and rotate up for your arm to reach all the way up overhead. In fact, if the shoulder blade does NOT raise up, the rotator cuff muscles will get pinched when the arm raises up. 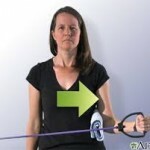 So, in fact to really get better from shoulder pain a person needs BOTH shoulder and shoulder blade exercises.